Just because a bunch of original Star Wars actors are coming back for the new trilogy doesn't mean they all are. 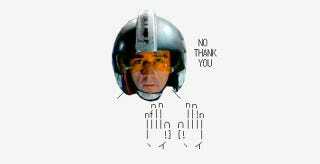 British actor Denis Lawson, who played Rebel pilot Wedge Antilles ion Episodes IV-VI, was approached to appear in the new film, but turned it down. The Courier caught up with him on the red carpet for his latest film, and when asked if he was appearing replied "I'm not going to do that." "They asked me but it just would have bored me." Sounds insane, but he has a point. Despite Wedge's popularity in the Expanded Universe, he had a fairly minor role in the actual films. Lawson is still working in both TV and movies; going back to Star Wars might have been more trouble than it was worth. They could just hire another actor to play Wedge if they really wanted the character back, but I mean, without the original actor - when the other old-timers are the same - that'd be more than a little weird.